Tenant and public networking leverages FD.io/VPP. VPP binds to both, the tenant networking interface as well as to the public networking interface on the compute and control nodes. The OpenDaylight network controller is used to setup and manage layer 2 and layer 3 networking for the scenario - with Group Based Policy (GBP) being the key component. Tenant networking can either leverage VXLAN (in which case a full mesh of VXLAN tunnels is created) or VLANs. Layer 3 connectivity is provided by using VPP as a “distributed virtual router”. The picture below gives an example for distributed routing using VRFs between tenant networks. 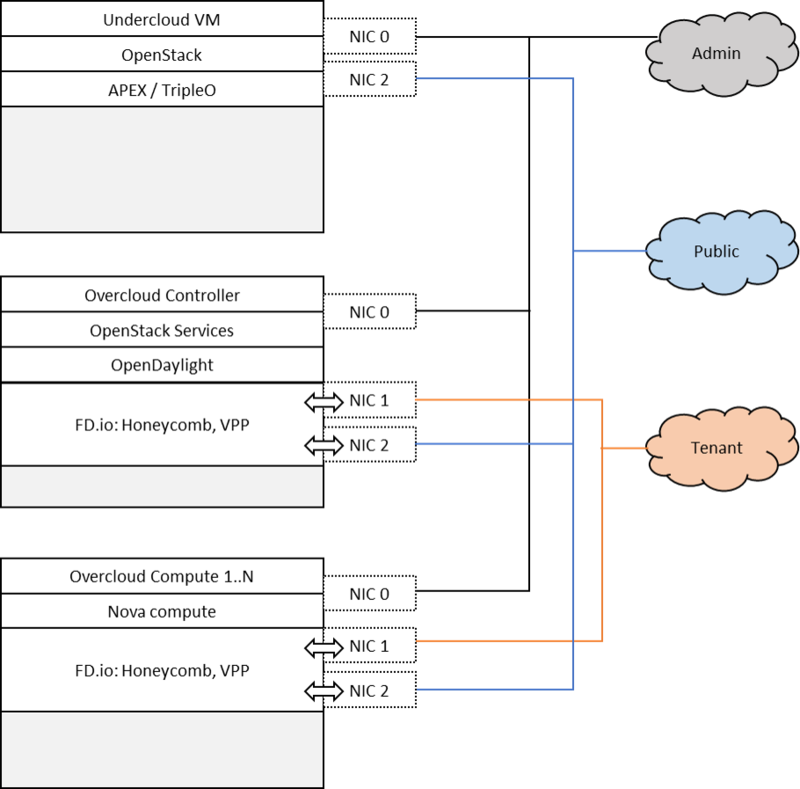 The apex-os-odl_l3-fdio-noha scenario combines components from three key open source projects: OpenStack, OpenDaylight, and Fast Data (FD.io). 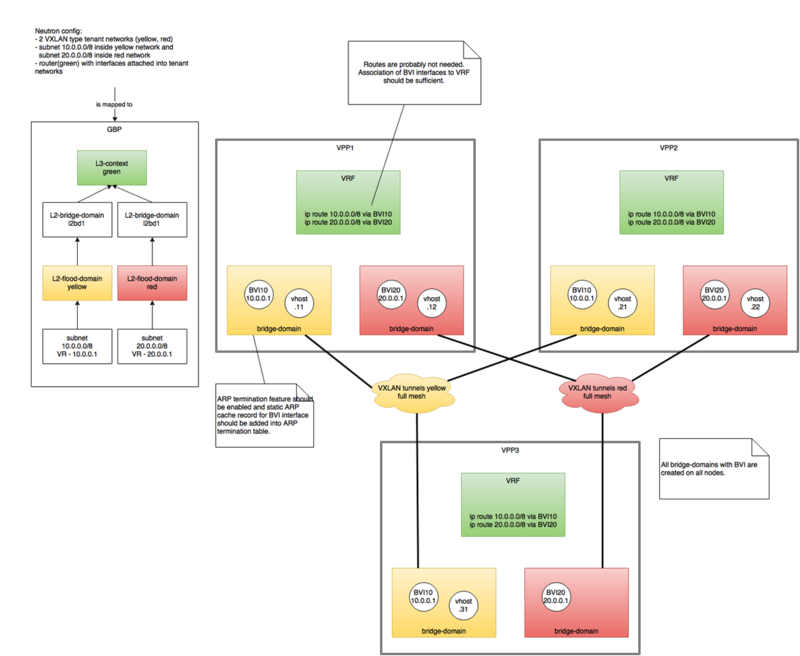 The key components that realize the apex-os-odl_l3-fdio-noha scenario and which differ from a regular, OVS-based scenario, are the OpenStack ML2 OpenDaylight plugin, OpenDaylight Neutron Northbound, OpenDaylight Group Based Policy, OpenDaylight Virtual Bridge Domain Manager, FD.io Honeycomb management agent and FD.io Vector Packet Processor (VPP). Note that the key components of the OpenDaylight based scenarios of FastDataStacks are the same. 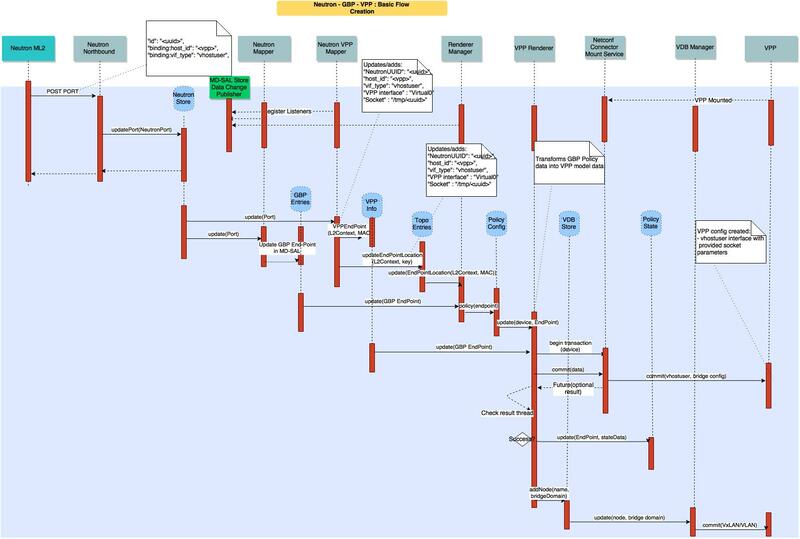 The Layer 2 scenario “apex-os-odl_l2-fdio-noha” and the Layer 3 scenario “apex-os-odl_l3-fdio-noha” share the same components. To enable the “apex-os-odl_l3-fdio-noha” scenario check the appropriate settings in the APEX configuration files. Those are typically found in /etc/opnfv-apex.